Eels (often typeset as eels or EELS) is an American alternative rock band, formed in California in 1995 by singer/songwriter and multi-instrumentalist Mark Oliver Everett, better known as "E" (son of famous physicist Hugh Everett III). Band members have changed across the years, both in the studio and on stage, making Everett the only official member for the most of the band's work. Often filled with themes about family, death and lost love, Eels' music straddles a wide range of genres, which is evidenced with the peculiar musical style of every album. Since 1996, Eels has made eleven major studio releases, The Cautionary Tales of Mark Oliver Everett (2014) being their most recent release. 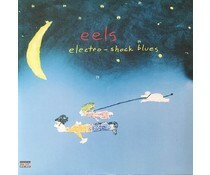 Eels appear on several film soundtracks, including Scream 2, American Beauty, Road Trip, Holes, The Anniversary Party, Knocked Up, Yes Man, The End of Violence, Hellboy II, Hot Fuzz, Cirque du Soleil: Worlds Away 3D, Charlie Bartlett, Enough Said, Delivery Man, and the first three Shrek films.